Huia bird was the largest New Zealand wattlebird species endemic to the Northern Island of the country. This species went extinct in the early 20th century. Conservation efforts to save this species started in the 1890s, but they were not properly enforced. The last confirmed sighting came on 28th December, 1907 in Tararua Ranges. Credible sighting reports came from Wellington region till 1922. Unconfirmed sighting reports from the Te Urewera National Park came till the early 1960s. Size Male – 45 cms in length; Female – 47 cms in length. Weight 700 to 900 pounds. Mean egg dimensions 45.7 mm in length and 27.9 mm in width. Nest Cup shaped with thick walls made by dried grass and leaves. Huia was a magpie-sized bird. Both sexes were similar in appearance with orange wattles and black plumage with bluish-green sheen along with a white tip towards the end of their tail. They had bluish-grey legs. Their sexual dimorphism was highlighted by their bill, which was dramatically different in size and structure. The female had long curved bill, around 85 to 105 cms long; while the male’s bill was less curved, around 55 to 60 cms long. Their calls were mostly soft and melodious array of flute-like whistles often referred as Huia songs. Males and females had different calls. Their calls were audible up to 300-400 meters away. 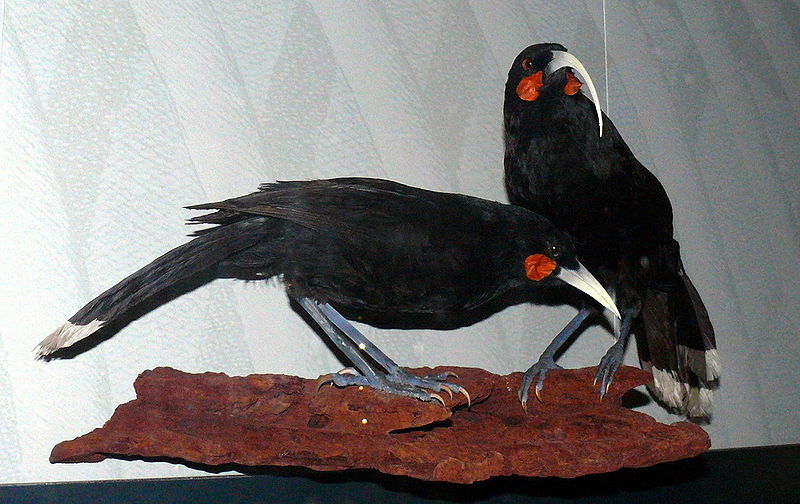 Bone remains indicate that Huia was common in lowland places and montane native forest across the North Island. Before the European settlement, they were found in large numbers in Rimutaka, Tararua and Ruahine ranges as well as in hills around Wellington. Few accounts suggest that they had seasonal movements. They lived in montane forests during summer while going to lowland forests during winter. 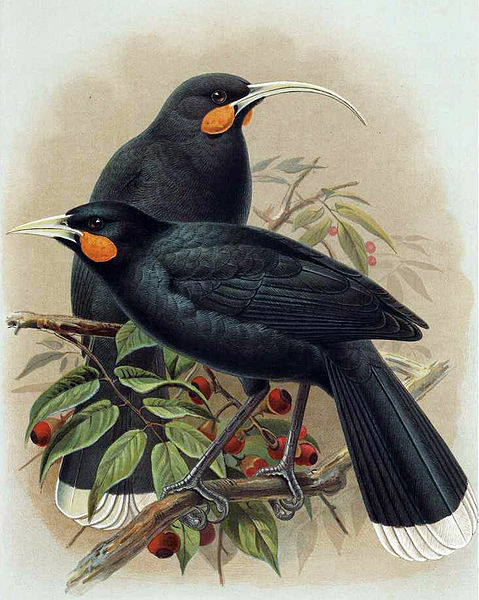 Huia’s food mainly consisted of wood-dwelling insects and their larvae. They also fed on native forest fruits like pigeonwood, hinau, coprosma and kahikatea. 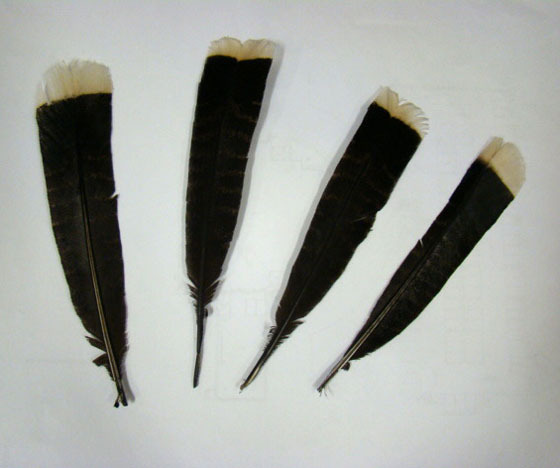 Huia tail feathers were the symbol of status among Maori. 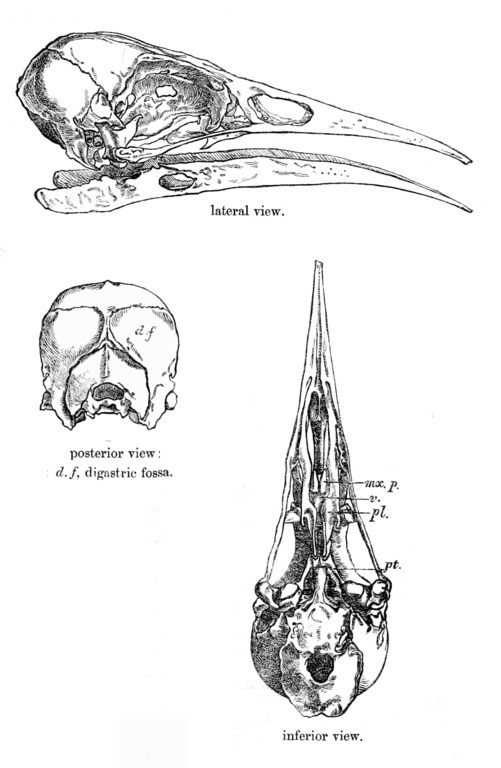 Rallicola extinctus, an extinct phtilopterid louse species, only lived on Huias. It is believed that they also went extinct with its host. Huias had no fear of humans and the Maori people reportedly captured them with hands. In fact, the Maoris also kept them as pets. New Zealand had earlier released several postage stamps depicting this species. 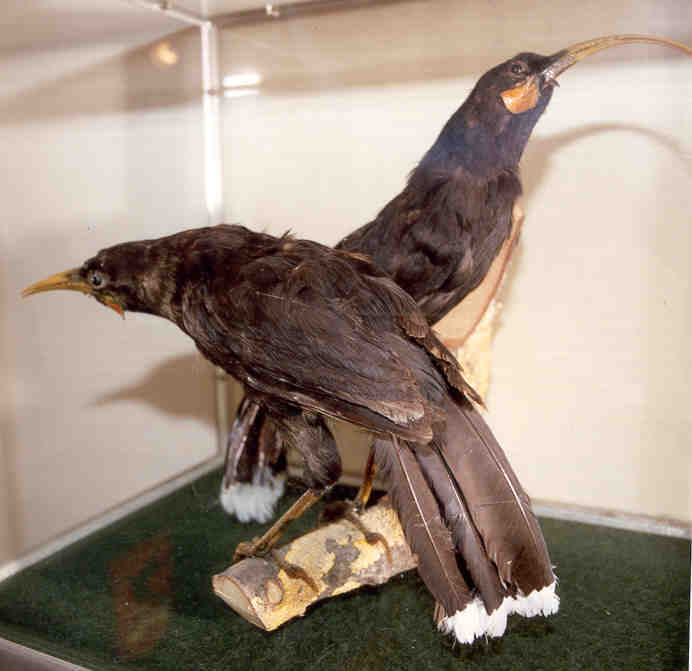 Museum für Naturkunde in Germany has Taxidermy Huia pair specimen. 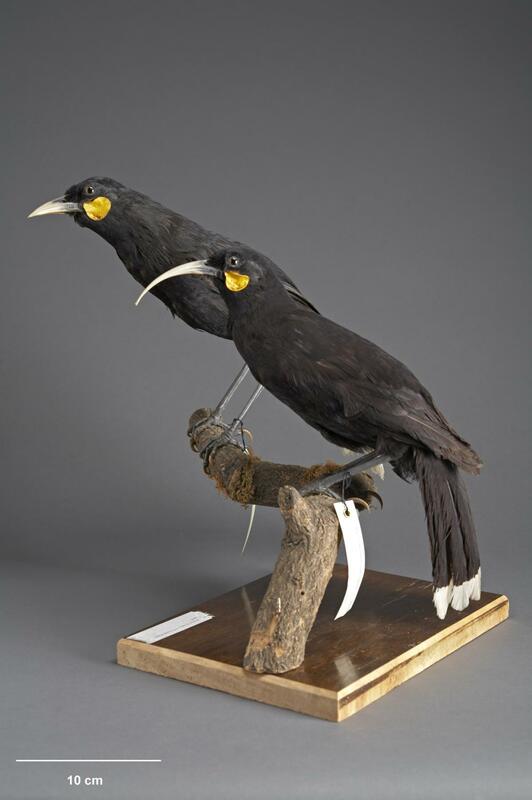 Huia cloning is not likely to succeed as the state of the DNA among museum specimens is not in great state. They used their bills to extract huhu larvae or dig into decaying foods and nuts. They used to hunt in pairs. Different type of bills allowed them to tap a wide array of food sources. Some accounts suggest that males often offered foods to their partners. They used to fly little distances, often hopping from tree branches to tree branches or on the ground. This species bred as monogamous pairs from October to February. The female laid 2-4 eggs around October. Incubation was mainly done by the mother. Chicks were brownish-black with an off-white tail band. Both male and female had fed the chicks for at least three months before they led an independent life. Overhunting and deforestation are the two reasons associated with this bird’s extinction. They were killed in large numbers because of their skins (mainly for mounted specimens). Their tail feathers also had great demand in the local market for hat decoration. Habitat loss triggered by deforestation after the European settlement played a role in wiping out this species. Published on July 31st 2015 by admin under Birds. Article was last reviewed on 31st July 2015.